For the last several years, Drs. Dan Martin and Rachel Appelblatt have donated their time and efforts to help Truckee-Tahoe community members in need to receive important oral surgery procedures during the free “Dentistry from the Heart” program. 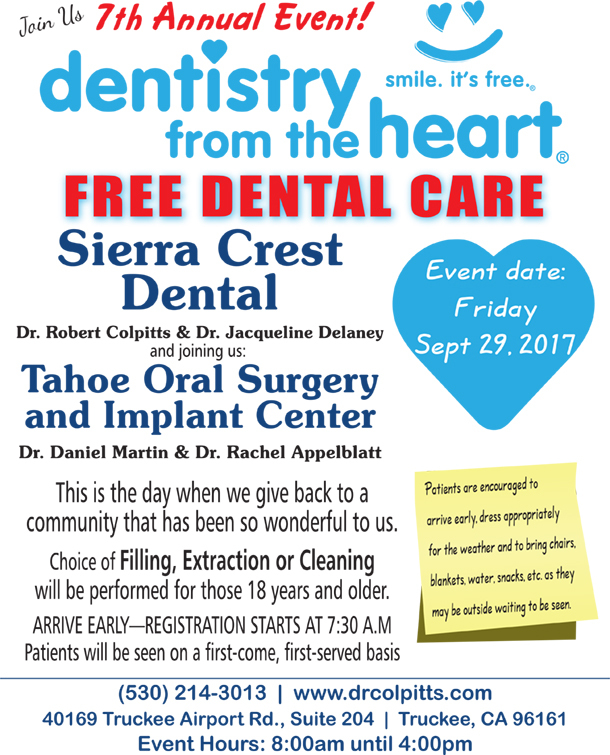 Dr. Dan Martin DDS will continue Tahoe Oral Surgery and Implant Center’s commitment to philanthropy on September 29th with Drs. Colpitts and Delaney from Sierra Crest Dental in the 7th year of this free event. Together these dental teams will be helping community members receive free dental care to those 18 or older who cannot generally afford these important procedures, including dental cleanings, fillings, and tooth extractions. To receive free treatment during this year’s Dentistry from the Heart program, registration is on a first come, first serve basis starting at 7:30 am at Sierra Crest Dental at Truckee Airport Rd, #204 in Truckee. Patients are encouraged to come early and dress warmly and bring chairs, snacks and water so they may be prepared to wait outside for their appointments given between 8am and 4pm September 29th, 2017. Questions can be directed to http://www.drcolpitts.com/ or 530-214-3013. ← How to Cope With Tooth Pain Until I Can See My Oral Surgeon or Dentist?